Last month, the terrorist organization Boko Haram kidnapped over 270 girls from the Chibok Government Girls Secondary School in a horrifyingly brazen attack that has garnered international attention and outrage. Yesterday, it was reported that an additional 8 schoolgirls were kidnapped in northeast Nigeria as part of Boko Haram’s continued campaign of violence and terror that has left an estimated 4,000 people dead in 2014 alone. It is a shocking story, but as a mother to a teenage girl the same age as many of the kidnapped girls, this one hits home like a punch to the gut. I can only imagine the anguish, grief, fear, and frustration the parents of these young girls have gone through these past three weeks, and continue to go through as the search for their girls continue. In situations such as these, it is natural to want to help, but often it is hard to know what to do. An event like this is not like a natural disaster, where supplies, rations, and monetary funds are suddenly urgently needed, and therefore a donation to the Red Cross or other aid organizations is an easily tangible means of helping those affected by the disaster. However, in this case, short of flying to Nigeria and storming into the forest to physically help with the search, what can we do? While continually funding women’s rights based organizations is so important, at the moment, our voices are the most powerful weapon at our disposal, because it was the power of grassroots social media campaigns that resulted in this story making international headlines in the mainstream media, and it was only after that had happened, nearly two weeks after the abductions, that Nigerian president Goodluck Jonathan publicly spoke out about his government’s efforts to locate the missing girls. On the contrary, in the early days of the crisis, the government and military of Nigeria attempted to make the story go away, and it has been suggested that this was to avoid any negative press prior to the World Economic Forum that started today in Nigeria’s capital city, Abuja. There are countless other reasons why the media did not initiatively pick up on this story, but the point is this: once the story broke out, international outrage has increasingly mounted, which has forced Nigerian officials to do more in their handling of the crisis. Demonstrations had been held throughout Nigeria, as well as in the UK and the United States, and #BringBackOurGirls has been trending worldwide for days now as part of a larger social media campaign aimed as focusing awareness on the story. In light of these developments, Nigeria has accepted foreign aid to help in the search for the girls, and today it has been reported that Britain, France, and the United States are sending special services to Nigeria. That is the power of the media, and while it is shocking and alarming that it took so long for the story to get out, as of this writing it is the number one story on google news, and is dominating social media. Until those girls are safely home with their families, we can all do our part by using the power we wield online to keep this story in the news, to keep applying pressure to the Nigerian government to find these girls, and to make it clear to the media that going forward we will not tolerate stories like this being ignored or swept under the rug. 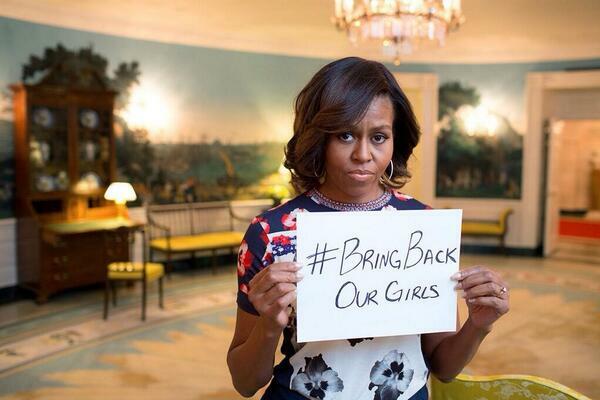 Twitter: #BringBackOurGirls – keep it trending and show your support.